The routes that migratory waterbirds traverse on an annual basis are known as 'flyways.' There are nine major flyways around the world. The East Asian - Australasian Flyway (EAAF) stretches from the Russian Far East and Alaska, southwards through East Asia and South-east Asia, to Australia and New Zealand and encompasses 22 countries. The EAAF is home to over 50 million migratory waterbirds from over 250 different populations, including 32 globally threatened species and 19 Near Threatened species. During migration, waterbirds rely on a system of highly productive wetlands to rest and feed, building up sufficient energy to fuel the next phase of their journey. International cooperation across their migratory range is therefore essential to conserve and protect migratory waterbirds and the habitats on which they depend. The routes that migratory waterbirds traverse on an annual basis are known as 'flyways.' This map is largely based on Shorebird routes. 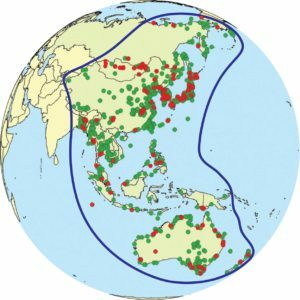 Establishment of an East Asian - Australasian Flyway Waterbird Site Network is a critical element of the Partnership and will ensure that a network of internationally important sites are sustainably managed to support the long-term survival of migratory waterbirds within the EAAF. The 'Flyway Site Network' draws attention to the interconnectedness of migratory waterbird sites through shared species and populations throughout the EAAF. Each site meets criteria for nomination that demonstrate its international importance for migratory waterbirds. More than 950 wetlands are known to meet one or more of the criteria and so far 135, spread over 18 countries, have been included in the Flyway Site Network. Only government partners can nominate new sites to the Network. The Partnership's Secretariat and other experts advise on candidate sites and criteria met and the Secretariat administers and promotes the Network. More information on the Flyway Site Network is available here.